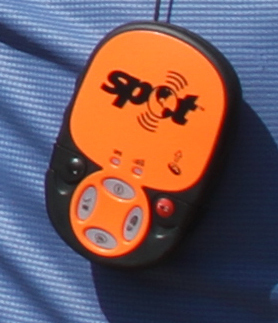 We got the SPOT GPS device back. When our van from Luxor to Hurghada returned, Muhammad our tour guide contacted me to let me know they had found it on the bus. More often than not it has been very helpful to have a local cell phone. Muhammad offered to but the SPOT on the next bus from Luxor to Hurghada. He subsequently called me with the name of the bus driver, the bus driver's cell phone number and the bus number. The bus was scheduled to arrive at 12:00 in Hurghada. I set off for the bus station at about 11:30 after my family had already turned in for the night.I was in for an interesting night. I went to the market and grabbed a Coke Light. If you know me well, you know that I consume several Diet Cokes a day. Coke Light is not Diet Coke. I then set off for the bus station. I asked a local at the Shisha cafe where the bus station was - the hotel had already told me it was nearby - and this man was kind enough to bring me across the street and hail a cab for me. I should have arrived at the bus station several minutes before the scheduled arrival, but the unscrupulous cab driver drove me through the local Souk and tried to charge me a fare higher than the hotel and the guy who hailed the cab for me told me it should cost. I later realized that the cab had driven past the back entrance and went several kilometers further to get me to the other side. This was the local bus station which few tourist use. It was hopping. There were many people there. buses would come and go and there was a hectic frenzy each time. I inquired of several people including the ticket agent, some kind of coordinator, and local merchants for any information on the bus from Luxor. They either had no information, or in one case told me it had already arrived and left. I attempted to contact the driver by cell phone but he didn't speak to me or he hung up quickly. I remained at the bus station for the next 40 minutes and met several interesting people. I met a young man who was from Cairo and worked in a restaurant in Hurghada. He was very excited about the revolution. I talked to a very nice shopkeeper for a while. His business has been hurt by the revolution in a economic chain reaction - no tourists - no jobs for locals - no locals traveling. I finally gave up. walked to the back gate and hailed a cab. 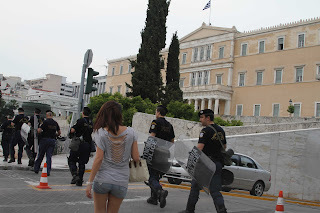 Fortuitously, the cab circled the block and on the way bast the front gate, I saw that 2 additional buses had arrived. I asked the cab to wait. I went back into the terminal and found a local that called the driver from my phone. We quickly connected and the SPOT was back in my possession. I have created a new page on the blog that has the SPOT tracking information. Let us know how it is working. After giving away my ring and earrings to some fabulous women in Athens one night after sharing some drinks,( we traded jewlery). Mark took me shopping on the streets of Hurghada for a new diamond ring and watch. We made a new friend at the jewlery shop. Today, we took a 40 minute flight to Sharm el Sheikh where we took a taxi to Dahab. Our taxi driver was Bedoin and their custom is to take us to tea, so our 1 hour trip took a detour not authorized by us where we had tea with our taxi drivers family. 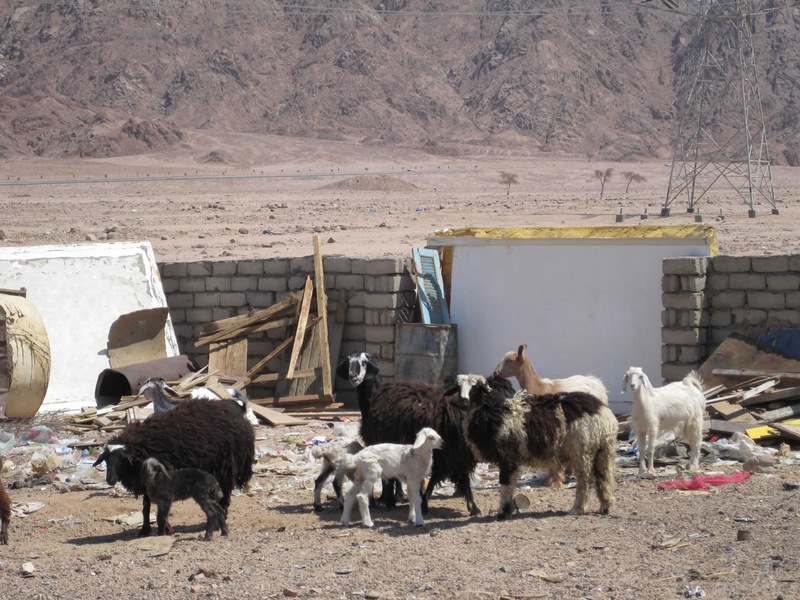 There were no windows in the home, no furniture, goats in the back yard and in the middle of nowhere. Our taxi driver then proceeded to get out his Bedoin tobacco (mary jane) and wanted to share with us. Mark told him he thought he should not do that and drive us 100km! he bragged that he does it all the time and can even drive 5 hours to Cairo! Given the winding roads and the speed at which he drove and the police check points, we were absolutely thrilled he did not have Bedoin tobacco. currently we are in Dahab on our way to climb Mt. St. Catherines tomorrow where Moses talked to the burning bush and we can see Mt. Sinai where Moses received the 10 commandments. This is a BEAUTIFUL place. Egypt is truly amazing and a beautiful place. This morning we took a flight from Hurgahada to Sharm el Shiek. From there we took our crazy taxi cab ride to Duhab. We also had fun finding the 4s hotel which was actually named ssss. The hotel has a pool, a foosball and pool table. Tomorrow we will drive two hours and climb Mount Saint Catherine were at the bottom Moses saw the burning bush and at the top where they found the body of St. Catherine and is also the tallest mountain on the Sinai Peninsula in Egypt and possibly in Egypt. During our time in Egypt, it was not like the news at all, it was quiet and peaceful. Today all we had planned was a twenty minute banana boat ride which I did not think was going to be very hard. Little did I know there would be no way to keep myself from falling. I really wasn't ready for the turn that flipped the boat over because when we started, they told us you couldn't go fast without 4 people. We began the ride and it was fairly easy and we could stand up or take both of our hands off. Then I noticed that the ride was getting tougher as we went along until Bam, we made a tight enough turn and did a barrel roll upside down and had no choice but to let go from the bottom. We also figured out getting on wasn't the easiest thing either. After a failed attempt, we were able to get back on and continue our ride. The next time we flipped, we were better prepared. We will try to post our first video of this later. I didn't know someone could drive a banana boat so skilfully. 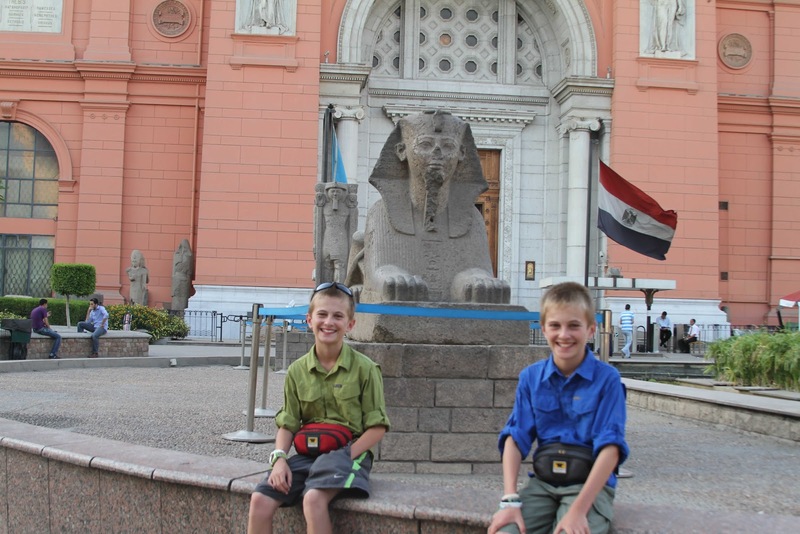 We are in Hurghada on the Red Sea for a little R&R from museums, history, and tombs. It is beautiful. It seems busier with tourists than some of the other areas we have visited, but again, few American's. We have met people from Russia, Poland, Belrus - you get the idea. We took a cruise on Father's Day to Giftin Island to snorkel and play on the beach. For the past several years, the Joanne and the boys haven't been home for Father's day, so it was nice to spend the day with them. It was a lot of fun. I read that the Red Sea is the warmest sea. Great coral reefs, colorful fish, towel orgami, dolphin sightings, and great weather left nothing else to ask for. On our trip to Hurghada, I had the SPOT GPS tracker hanging from the curtain in the van so we could track our trip through the desert. Upon arrival in Hurghada it was clear that our driver didn't know where our Hotel was despite telling us he did when we set out. 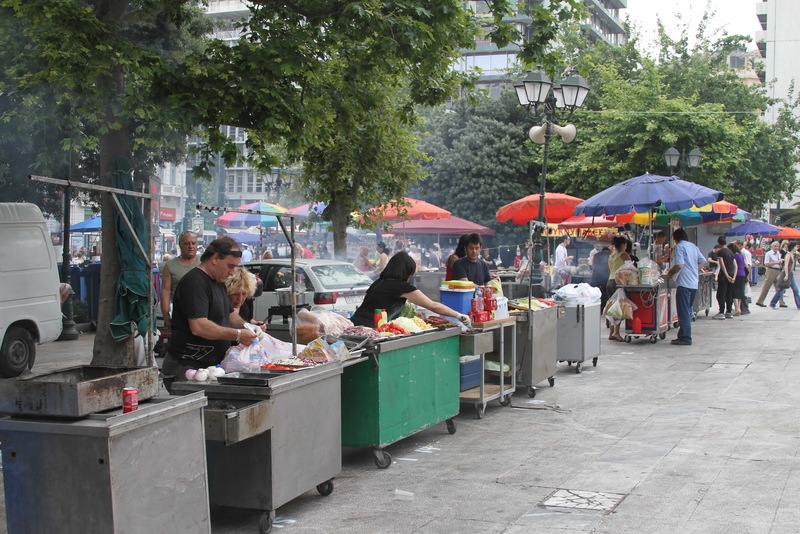 We have seen this scenario many times on the Amazing Race show. After inquiring from a number of people, we began to believe our driver couldn't even follow directions. Taking a page from the Amazing Race, we hired a local taxi to lead the way to the hotel so our driver could follow. This was despite our driver not wanting to do this, thinking it was some kind of affront. After being quickly let to the hotel, we excitedly climbed out of the van and I left the SPOT behind. I am trying to see if I can recover it, but have limited hopes. I will see if i can replace it, but until then, it is just registering the ramblings of a tour bus in Luxor! 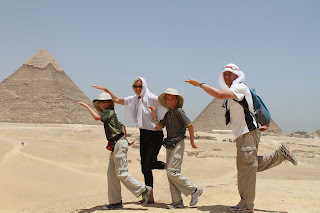 On our trip to the pyramids in Giza, to beat the heat, we decided to travel by horse. I noticed it was kind of weird when I was sneezing about 10 times every 30 seconds, but I thought it was a common allergy. When we got through the Tourist Police gate, I noticed that my breathing wasn't 100%. I told my Dad, "Maybe I am allergic to my horse," not thinking it was true. My breathing continued to get worse and I began to feel bumps on my body. We stopped the horses, got off and I walked in front of the horses with my mom and dad switching off walking with me. I didn't feel any better, so the guide called to have a car come pick me up. We bought some antihistamines and an inhaler at the pharmacy and I felt better soon after. It took longer for me to look better. It is hard to stay away from horses here in Egypt because everyone is offering carriage rides. In fact, yesterday when we visited Horus' temple in Edfu, the only way to get there was by carriage. I had to ride the whole way with my shirt covering my face. I hope to encounter more horsepower than horse power on the remainder of the trip. 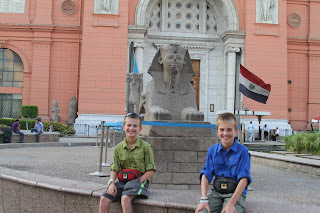 We visited the Pyramids and Sphinx in Giza and the Museum in Cairo. Amazing sights and a lot of heat. Unfortunately we learned that Nathaniel had an allergic reaction to his horse. We stayed at the Vienna Hostel and might a nice family from Marin with a 12 -year boy and a 9-year old girl that has been traveling since January, heading the opposite direction. They gave us some tips for Luxor and Israel. We are looking forward to the next part of the trip. Tonight we taking an overnight train to Jordan Aswan (don't know how that happened). Even though the protests in Sytagma square were the number 2 headline on our CNN news feed yesterday, we went through the square to catch our metro to the airport. All that was there were people making speeches and chanting what they wanted and carry banners. The inconvenience for us was that the workers that take the metro to the airport were on strike, so we took a bus instead. The past couple days found us visiting ancient sites in Delphi, home of Apollo's temple and the Oracle, and Mycanae, home of an ancient culture thought to be the Greeks of Homer's tales. Given that we have been reading Homer, it was great to come face to face with these sites. The stones in Mycanae were so large that the Greeks thought it must have been built by Cyclops. We had seen many of the Mycanae treasures in Athens so it was fun to put this all together. Yesterday was a beach day and today we are back off to Athens. We decided to skip the Greek Islands for now for several reasons 1) some big event this weekend 2) no tours that did exactly what we wanted 3) a desire to beat the heat in the Middle East and 4) to leave time for a possible Red Sea R&R trip. So we are catching a flight to Cairo tonight. Talk to you from there. Today as we toured Athens we found ourselves in the protesters we thought we would plan to avoid. We will make sure we understand where Tahir Square is in Egypt before visiting there so the same thing doesn't occur. That said, it was interesting to see the scene in person. People we have met think that Murders and Drug Gangs are part of our everyday life in the United States because that is all they see from the media. The media adage, "if it bleeds it leads" distorts our view of the world. 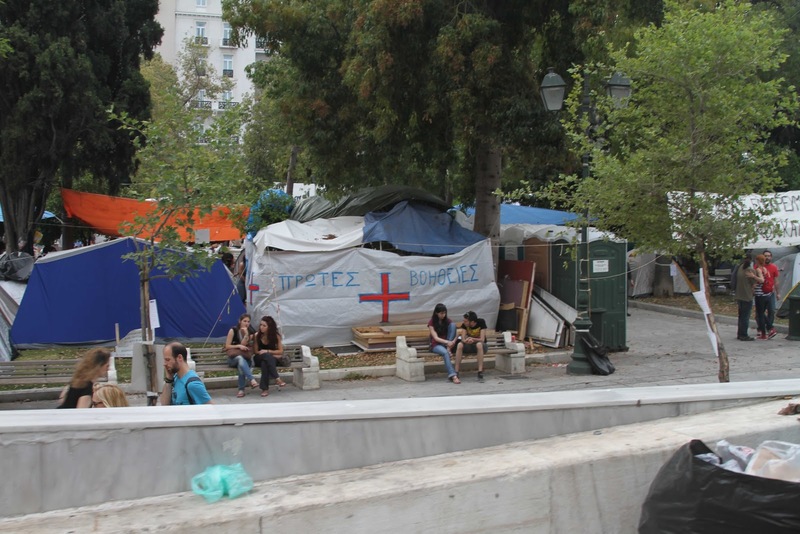 We arrived in Greece after a two hour flight from Italy. The alphabet and language had changed completely. The alphabet is the most confusing because as you can see from the picture above, you can't even try to sound out the words. Circles with lines through them, triangles, end even math symbols like pi. I have just finished reading Julius Casaer and recalled Casca's line "it is Greek to me." I can really see where he was coming from! If you didn't know, the book in the picture is "Diary of a Wimpy Kid," but I don't think I will be reading this version anytime soon.